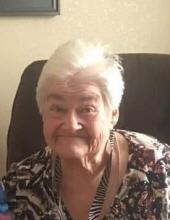 Hastings resident Jan Weir, 75, passed away Monday, January 14, 2019, at Mary Lanning HealthCare in Hastings, Nebraska. Memorial service is 10:00 am, Thursday, January 17, 2019, at United Pentecostal Church in Hastings, NE with Pastor Wilson Fessenden officiating. A graveside service will take place at a later date. DeWitt Funeral Home and Cremation Service is handling arrangements. Memorials may be directed to her family for later designation. Jan was born on May 19, 1943, in Hastings, Nebraska the daughter of Clarence and Genevieve (Douglas) Hacker. She married Andrew Weir in 1964. She raised her family in Hastings, Nebraska. Jan enjoyed singing Karaoke, dancing, and spending time with her grandchildren and great-grandchildren. Jan is survived by her children, John Weir of Hastings, NE, David Weir of Wymore, NE, Felicia Melendez of Hastings; two grandchildren, Tanner Weir and Andrea Melendez; two great-grandchildren, Isaiah and Anelise; four sisters; Dorine Hacker of South Carolina, Joan Knisely of Hastings, NE, Janet Cutino of Idaho, and Danita Boutin of Hastings, NE; two brothers, Gary Hacker of South Dakota and Gerald Blanchard of Hastings, NE; along with numerous nieces and nephews. To send flowers or a remembrance gift to the family of Jan Weir, please visit our Tribute Store. "Email Address" would like to share the life celebration of Jan Weir. Click on the "link" to go to share a favorite memory or leave a condolence message for the family.